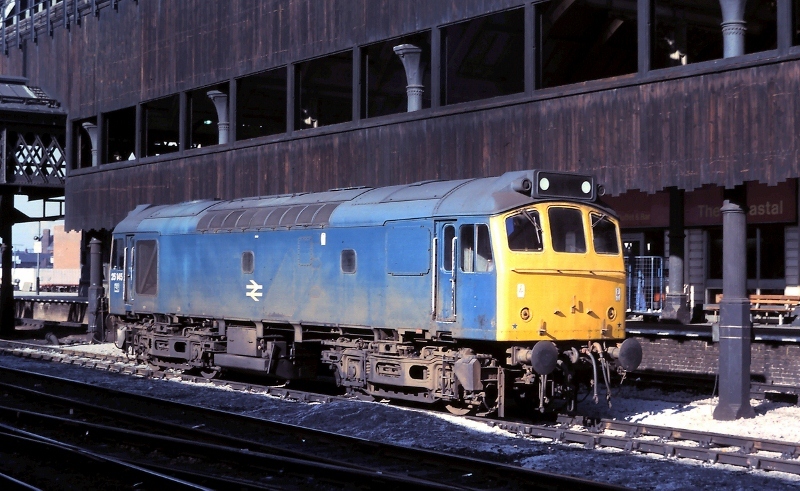 Martyn Hilbert's Railway Photography - BR Blues - Class 25, 25145 at Manchester Victoria. Class 25, 25145 at Manchester Victoria. In September 1979, Class 25 25145 was the wallside pilot bank engine at Manchester Victoria. The locomotive was on standby to bank eastbound freight trains up the steep gradient to Miles Platting. The wallside pilots, along with the old ramshackle Manchester Victoria with its coastal buffet, visible here in the shadows behind 25145, are long departed.